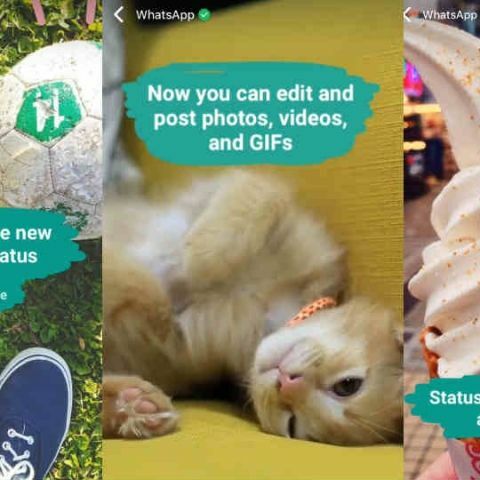 WhatsApp has revamped its “status” feature to take on Instagram and Snapchat Stories. WhatsApp has revamped its status feature. Just like Snapchat, statuses will be active for only 24 hours. Your status will be visible only to those in your contact list. Users can update their status using photos, videos and GIFs. A statement released by WhatsApp says, “We are excited to announce that, coinciding with WhatsApp's 8th birthday on February 24, we are reinventing the status feature. Starting today, we are rolling out an update to status, which allows you to share images and videos with your friends and contacts on WhatsApp in an easy and secure way. Yes, even your status updates are end-to-end encrypted”. Users will be able to add a personal touch to their status without worrying that others, who aren’t in their contacts will be able to see it. The WhatsApp status will be split into three groups – My Status, Recent Updated and Viewed Updated. My status, as the name suggests, will show users their own status, the most recent one. Recent Updates will show the new Status that your friends have created. This will of course be limited to the past 24 hours. Viewed Updates will show the Status messages that you have viewed. In case you are not happy with a status update and decide to delete it before the 24 hour period, it will be deleted from the phones for all your contacts. Facebook owned WhatsApp has 1.2 billion monthly active users, posting over 50 billion messages a day. It's needless to say that the highlight of the app was chatting and sharing videos and pictures. But with apps like Instagram and Snapchat hogging the “status” sharing sphere, it looks like WhatsApp didn’t want to be left out. Till now WhatsApp status were boring text-based messages like, “Available”, “Busy”, or “Hey there, I’m using WhatsApp”. The creative few would put up their favourite quotes or something else that's limited to 139 characters. The WhatsApp blog post goes on to say, “Just like eight years ago when we first started WhatsApp, this new and improved status feature will let you keep your friends who use WhatsApp easily updated in a fun and simple way”. The new Status feature will not be hidden like it currently is. The feature will find place between Chats and Calls. The status feature will be rolled out initially in Europe. It will release in the rest of the world soon after, including India. It will be available on Android, iOS and Windows Phone. Suggest me phone with Dual sim and status symbol. ?